July 3, 2013, 8:51 PM · For the past year, you've voted with your ratings of the world's most popular theme park attractions here on Theme Park Insider. And today, for the 12th consecutive year, we are pleased to announce the winners of the Theme Park Insider Awards, the best of the best in the global theme park industry, voted on by you, the world's best theme park fans. We used the cumulative ratings submitted over the past year by Theme Park Insider readers to determine the winners in four categories: Best Theme Park, Best Hotel, Best Restaurant and Best New Attraction. We determined the Best Theme Park award by determining which parks had the largest number of highly-rated attractions that received more than a minimum number of ratings. In the other three categories, the eligible location with the highest average reader rating, given at least a minimum number of ratings, was declared the winner. We considered only table-service restaurants in the Best Restaurant category, "official" on-site hotels for Best Hotel, and attractions that opened officially since July 1, 2012 in the Best New Attraction category. With those techie details aside, let's get to this year's winners! This is the third overall Theme Park Insider Award for Best Theme Park for Tokyo DisneySea, and second in a row. 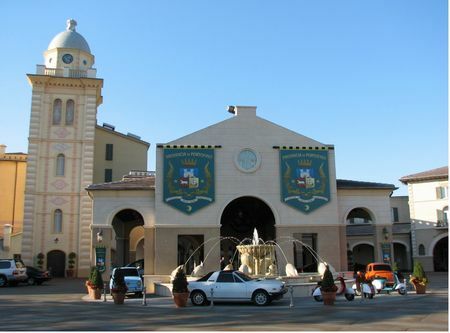 This is the third overall Theme Park Insider Award for Best Hotel for the Portofino Bay, which last won in 2009. This is the first Theme Park Insider Award for the S.S. Columbia Dining Room, which is the first restaurant outside the United States to win our Best Restaurant award. This is the second year in a row that an attraction outside the United States has won the Best New Attraction award, following Universal Studios Singapore's Transformers: The Ride (which shared the award with its sister attraction at Universal Studios Hollywood). For the first time, a majority of our winners represent parks outside the United States, with the Tokyo Disney Resort claiming two of the four awards, and Hong Kong Disneyland claiming the third honor. Universal Orlando kept the American theme parks from being shut out, as Universal Orlando returned to winning after a one-year absence last year, which followed an 11-year streak of winning at least one Theme Park Insider Award every year. Congratulations to all of these parks, and to all the people who help make them award-winning destinations! July 3, 2013 at 9:11 PM · Great to see Portofino win. We'll be there Sept. 21 to Oct. 4th. Disney Seas seem to be the best theme park in the world at this point. But Universal might give it a bit of a challenge once Diagon Alley opens. Glad to see Lombard's Seafood Restaurant get some recognition. Its an excellent restaurant. Nice theme and good food at an affordable price. 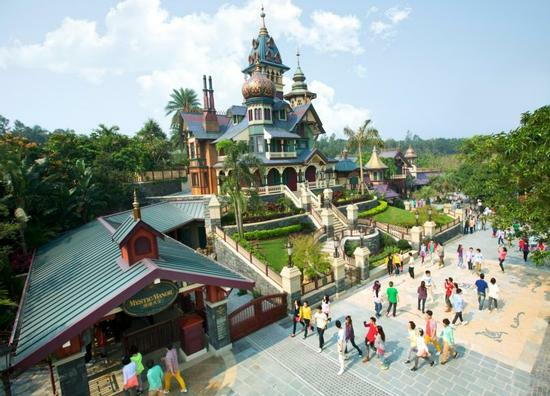 July 3, 2013 at 9:10 PM · With the winner and other runner-up going to rides at Hong Kong Disneyland, I wanted to point out that, technically, I suppose one could say that we've voted Outlaw Run the best new attraction of the year in America. July 3, 2013 at 9:23 PM · I knew Tokyo DisneySea was going to win. Glad to see Portofino Bay win best hotel! July 4, 2013 at 4:26 AM · It speaks volumes as to how Disney and Iger are ignoring the WDW with the overseas parks winning so much. Unfortunately, I think this will continue and WDW will continue to go down the drain. But buy those DVCs, folks! July 4, 2013 at 6:24 AM · Kudos to Outlaw Run and Silver Dollar City! What an honor for such a humble, Midwest theme park to be among such prestigious company. And for those of you who have doubts, I strongly urge you to visit the best theme park west of Orlando and East of Anaheim and learn first hand why Silver Dollar City is such a special place. July 4, 2013 at 7:13 AM · Nothing surprising here. Quality won out, as should always be the case. Magic Kingdom just saw it's largest expansion since the park debuted 40+ years ago, with meticulous theming on par with TDS. Once The Dwarves Mine Train Coaster is completed, it will be the culmination of a very beautifully themed, highly immersive expansion. Mind you, I enjoy bigger high end thrills like Tower of Terror, and Revenge of the Mummy, but for what it is, New Fantasyland is a fantastic addition to that park. Work has started in AK for Avatar, with the construction of a new venue for the Lion King in Africa where the show rightly belongs, clearing the way for that $500 million project to begin. Which, despite what all the cry babies and haters say, I'm sure is going to be another highly immersive environment created by the good folks at WDI in conjunction with James Cameron and his attention to detail and desire to push the limits of storytelling technology no matter what medium he happens to find himself working in. Over at DHS, they seem to be working up steam to giving this park a California Adventure like re-imagining. It's pretty much a foregone conclusion that Star Wars land is coming, as well as either an East Coast version of Carsland or the possibility of another Pixar themed expansion to that park such as Monsters Inc., which I would imagine the plans for that door coaster are being revisited and kicked around with the recent success of the sequel. That leaves only Epcot, which seems to be the red headed step child park. Nothing in the way of new Future World projects has stirred up in the rumor mill, aside from lay overs, updates and re-imaginings. There's been no talk of capital investments for any type of major expansion in the imminent future. In World Showcase, a Brazilian pavilion has been the hottest rumor going, but no apparent traction ever seems to take place. So I will concede Epcot as a Turkey, where showing love to the WDW parks is concerned. Lest we not forget the Disney Springs project, which is another undertaking of themeing by WDI, in the hopes of taking an outside shopping district and encompassing it all into a cohesive story, with design elements to help further immerse you in the idea of the story they are trying to tell. Mind you, I'd trade all that nonsense in for a return to a proper, working Pleasure Island complete with the triumphant return of the Adventurers Club. So as you can see, although not perfect, and in some cases quite flawed, the WDW resort seems to slowly be emerging from it's "investment in expansion and new attractions" slumber. I'm not a big fan of all the DVC expansion, but plenty of people buy into the program, so the demand is there, otherwise no more DVC's would be built. As this decade roars to a close, the landscape of the WDW resort stands to look much improved upon by the time the 50th anniversary rolls around in 2021. July 4, 2013 at 12:06 PM · Great awards folks! As someone who is a domestic frequenter of theme parks and avid follower of this website, I'd like to see things broken in separate categories next year, similar to airline travel awards. Domestic vs. international, including overall. The will help keep the domestic only folks excited and engaged, while providing great international insight as well. July 4, 2013 at 1:40 PM · Tokyo DisneySea wins yet again, and although a lot of us haven't visited that park I can see why it should win. Hopefully one day soon, I'll get to visit that park. What should also be noted in the best park award are the runner-ups, Disneyland and California Adventure. Although Disney World as a whole is larger, the two best Disney parks in America are in Anaheim. July 4, 2013 at 11:19 PM · Honestly, Disneyland should have won as best overall theme park. Since most readers of this site have not visited DisneySea, why vote solely based on reputation? You should vote for things you have experienced first hand, not through YouTube videos. As for DCA coming in second...that's the effect of Cars Land and the overall expansion. Disneyland is still and easily the best theme park in the U.S.
July 5, 2013 at 1:11 AM · Actually, a good number of Theme Park Insider readers have been to DisneySea. That's one of the great strengths of the Internet — it's international reach. I've worked hard over the past few years to increase the site's international readership, because I think it's important for theme park fans to know what's happening around the world. Information helps customers find better choices, or, at least, to have more confidence that the choice they've made is the right one for them. July 5, 2013 at 7:16 AM · It's sad to see no love for WDW at all but there is indeed nothing there that can compete with the winners. Yes new fantasy land and tangled toilets emerged but it's very mediocre. It is a mitch match of different movies and theming. That is not what makes a good land like the lands in Disney Sea do exceptionally good and why Cars land and Harry Potter land makes them so beloved by guests. The whole Belle cottage experience is (minus the magic mirror) painful to watch and the story is even broken because you are supposedly magically transported to the beasts castle but after exiting you are in front of the castle without a mirror. That is bad story telling not Disney worthy. Yes the restaurants and shops are nice but I go there for the rides and show, the rest is an add on. Then we have the little mermaid that tells the story of the movie again in 4 minutes with a ride system that is done to death. It's also a shame that the beautiful outside of the building doesn't live up to the inside. Lets hope the DHS are getting a great make over and Animal Kingdom gets some quality attractions and Epcot's Future World gets some much needed love so we can be excited again about WDW. For now my theme park money is going to their competitors. July 8, 2013 at 6:10 AM · Was thinking for the restaurants next year it gets divided into three groups to compare apples to apples.